No, I'm not crying into this pillow. According to the Boston Terrier Club of America, there are over 20 eye diseases known to affect the breed. The most feared are juvenile cataracts, which can cause very young dogs to become permanently blinded. Because their eyes bulge, you might want to make a habit of carrying veterinarian-recommended eye washes with you when you take your dog for a walk. 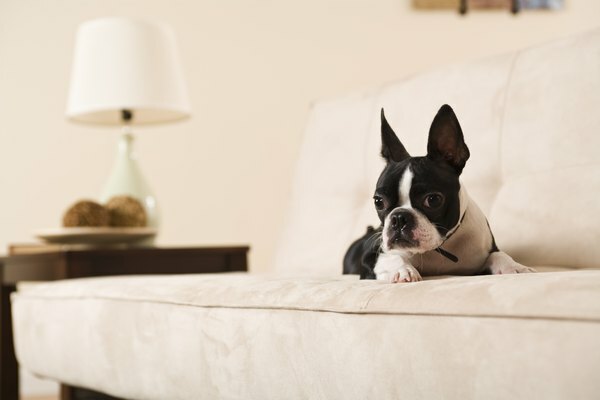 While dust and other materials might get into the eyes of any dog -- or person, for that matter -- the Boston terriers' protruding eyes are a greater risk of scratching and injury. All dogs have a third eyelid in each eye's corner, which under normal circumstances you can't see. Formally called the nictitans gland or nictitans membrane, this eyelid has a tear duct. The dog's other tear duct, the lacrimal gland, lies above the eye. The third eyelid functions to keep debris off the cornea and produces secretions to aid in fighting infections. Boston terriers are prone to prolapse of the third eyelid, a condition commonly called cherry eye. Dogs suffering from cherry eye exhibit a large, swollen, red mass in the inner corner of the eye. According to Mar Vista Vet, in small dog breeds such as Boston terriers this gland is not held strongly in place. While this eye problem is quite obvious, other symptoms of cherry eye include pawing at the eye to ease discomfort. The affected eye might discharge watery fluid, or thicker secretions if the eye is infected. Initially, your vet might prescribe eye drops to stop inflammation and shrink the cherry eye, as well as antibiotics to combat any infection, but most of the time that doesn't do the trick. Surgery is generally required to prevent damage not just to the tear duct but also to your dog's cornea. In the past, vets treated the cherry eye mass as if it were a tumor and just removed the entire thing. Today, the gland is put back where it belongs, since removal causes dry eye in dogs. The success rate for this surgery is very high, but recurrence of cherry eye is also quite common. Can You Use Nail Clippers on Puppies' Nails? What Are the Causes of a Third Eyelid in a Kitten?